The voting thread for Carrara Challenge VIII is now open. Please, post only your entries in this thread: comments and discussion are welcome in the WIP thread. .
- This thread will be converted to the voting thread on April 21, 2014 at 9:00 PM MT. - Theme, Description, comments, and other discussion. Don’t forget the fabulous PRIZES! Thanks again for your generosity, DAZ 3D and Mmoir. - 1st required item: Terrain Editor: Made custom heightmap in Photoshop then used the erosion functions in the terrain editor to create a plateau and a valley. Used the shader tree to make a custom texture based upon Yellow mesa 2, then added a custom shader zone based on elevation and slope to create a green region in the valley. Used Photoshop to define the river in the valley. - 2nd required item: Fence and barb wire made in vertex modeler. 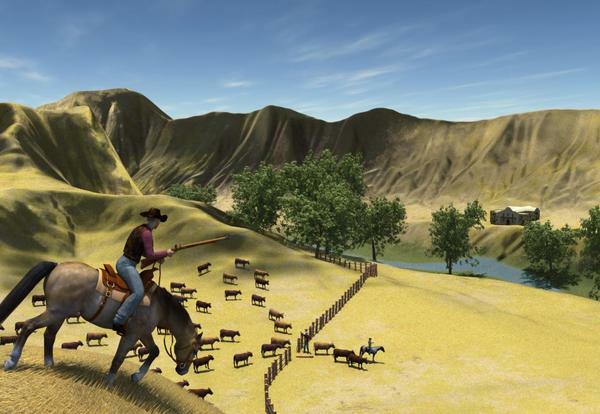 - Credits: M4, CB cowboy clothes for M4 (retextured and morphed), Horse 2, Mane and tail (used to make grow regions for hair), Bit, Bridle and Saddle for Horse2. Noggins cow (retextured and morphed), P5 Don Casual and P5 Jacket (retextured), The Alamo from content browser. Millenium Horse. No plugins. - Theme = Don’t fence me in. 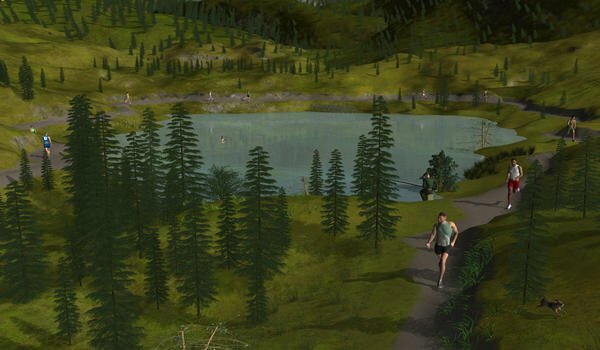 Also used a custom replicator: Used photoshop to create distribution map along the sides of the river banks for the trees. Also created a distribution map on the plateau for the cows. Converted the cows to real instances to better control near the gap in the fence. Used hair modeler to make the grass on the foreground. 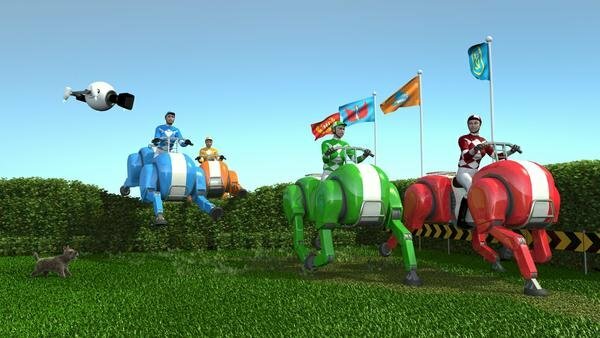 - Models used: BWC Raft, BWC Elven Raft, Ranger Outfit, GF2, Lady Elf Hair, Killzones (bath tube), Carrara Skin Shaders For David 5, Corroded City, fir tree and much more. - The Great Race, with a twist. Terrain- Distant terrains are INSERT : TERRAIN, side terrain is the same, edited with erosion and then stretched and flattened. Replicator- Leaves are replicated on a cone for the wind effect behind the car. The road has a gradiant shader on the edge for the leaves, stones and plants to thin out towards the road. The grassy area also is using a gradiant shader for the grass for a thin to denser coverage from the road to the field. Custom: The police lightbar, the the darker shaded grass, the road and surrounding grassy field and the stones. Road texture painted with the paint brush and stamper, then exported out for the little details and imported back in. 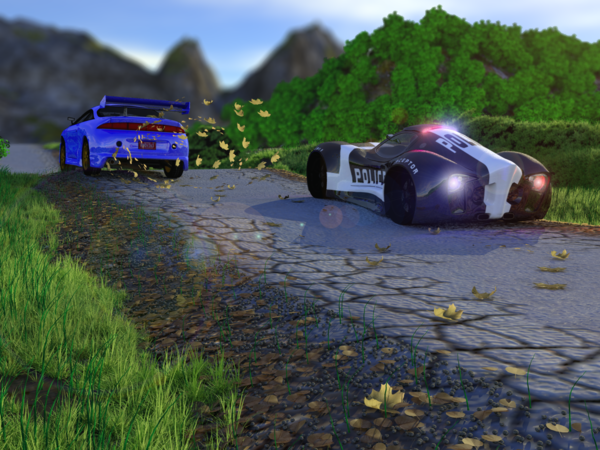 Models used: Yamaki with my police texture, the FFTuner with a blue shader. I used Carrara's tree creator for the background trees. The light colored grass and leaves I used them from Forest Drive. Postwork: DOF map applied in Photoshop. The "horse" is modelled in Hexagon, and assembled in Carrara, with ball joint constraints. The camerae is modelled in Carrara. I then set up one horse with jockey. Got it shaded, and then using Fenrics Plugin : Tree Duplicate, created a new contestant, wich I then reposed, and adjusted shaders. The hedge is a custom Carrara plant, replicated onto a hedge shape (wich is hidden) and a branch of the plant is used as litter and replicated on a "littershape". The lawn is a grass straw, replicated onto a circle, converted into real instances, and then replicated onto the lawn. Using two shading domains on the lawn, I used a copy of the original grass patch. and damaged it, and replicated it on the second shading domain. For the hedge and the lawn, there are 4 replicators. The flags are one softbody simulation, wich I exported out at different places in the timeline, and imported back into Carrara. Custom shaders on the flags. DAZ Millenium Puppy, with Carrara Hair. Terrain- Distant terrains are INSERT : TERRAIN, The road and field is terrain with the road cut into the terrain using the edit map feature, the shader map was created in photoshop from the texture exported out of Carrara. Replicator- The shader for the road had 2 ruts so the plants only replicate down the center and on the edges. The corn field replicator shader was lines so the corn is in rows. Custom: The cloud mesh with my texture map. The fence is just rectangles with a wood shader, then duplicated. The corn stalk is a vertice object with colored shader. The tall thin grass. 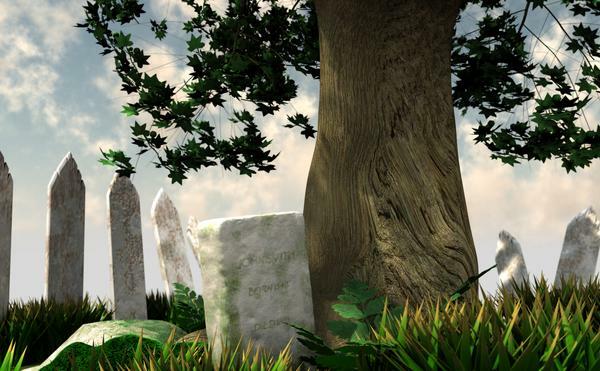 Models used: I used Carrara’s tree creator for the background trees. 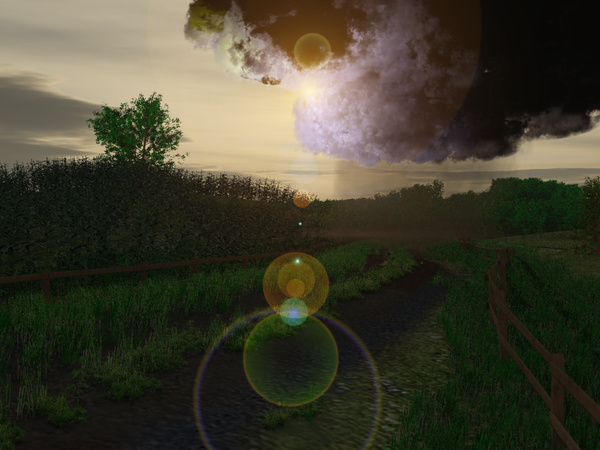 The grass clumps I used them from Forest Drive and the clouds and rain are volumetric clouds. The rain I had to duplicate the volumetric clouds and adjust size to give that rain hitting the ground thickness. I also used spotlights with a couple different colors aimed at one side of the cloud to light it up while leaving the side opposite the sun dark. For the ground, changed shading of Carrara ground terrain along with converting to more flat surface with indentation for river using the map editor. Inserted Ocean wih turbulence for swimming caribou/reindeer. Used Carrara High Mountain with snow...two intertwined. A bit of mist from Realistic Skies. 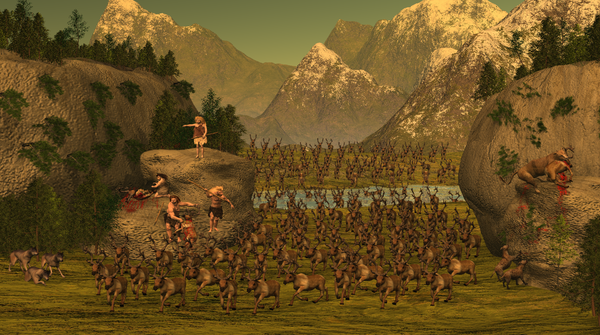 Took a moose cow body by Alessandro Mastronardi, morphed her to a smaller more compact physique and made reindeer/caribou antlers in vertex modeller but was not able to properly attach them to the body, so after making poses, changed all to objects and copy and pasted as they would not replicate properly. Hey, I'm a noob, I make mistakes! But did make the texture for them. Using Evil's example of making cliffs, I made simple ones and used Dartanbeck's custom limestone texture he made put out for anyone to use in one of his posts on creating terrains. Made my own hunters' spears. Made blood in 2D PS and laid on rocks with Modifier bending and dissolving. Created Carrara hair for hunters heads, beards and men's loin skins and huntresses' "dresses" which were all made.Haired for blonde on top, no hair on brunette' dress butchering, just her hair. Credits (content, plugins,…) Extensive use of Dartanbeck's Easy Environments trees everywhere on the clifftops and around the bottoms. Used Andrey Pestryakov's Wolves (Canus Lupus) as they come. Used DAZ Hyaena Crocuta as they come. Used DAZ Millenum Big Cat Lion as it comes. Used Andrey Pestryakov's White Birch trees and I changed the bark to brown and stuck them into the limestone cliffs as hanging vegetation. Theme, Description, comments, and other discussion. Hope descriptions are OK and within rules. This was done whilst taking a lot of medication, so just done for fun and to join in. I have a lot to learn, but enjoyed it and hope to see more noobs here in future! ETA: Re-uploaded image after resizing, no other changes! 1. (Requiered terrain) terrain was created based on the depth-pass of the scene to control vine-growth in Ivy Generator. The terrain is not visible in the image, but it was used to create the branches for the image. 2. (Required replicator) custom-shader replicators were used to attach leaves to the vines and create the living plant. 3. Frame modeled & UV-mapped in Carrara. 5. Ivy Generator (outside of Carrara) branches (several of them) morphed (inside Carrara) to fit together well and create diversity where the same base ivy mesh is used more than once. 6. Stock Carrara dynamic hair (the ponytail seen on the kid's head), re-brushed, re-shaped, re-cut and re-shaded to fit the image better. - Genesis M5 with a custom morph mostly based on David 5, M5 and Genesis body mophs, with a big mixture of adjusted maps, most of which are M5 base, mixed with David 5 normals and Freak veins. - V4 head with a mixture of textures from different characters (Lana, Amy, Reby Sky) and my own custom morph. - 5 times the ladies Carrara Dynamic hair. - Kids 4 head also with mixed maps for shader and Kaitey for Kids 4 morph. Custom shaders on everything except the frame, which has Carrara's stock copper. Process: Started with the frame, then positioned the male character inside it, posed and morphed. Added the 2 heads and rendered it all out at low resolution with depth pass. Used Depth pass slightly modified in Photoshop to create a scene-shaped terrain and export it as a low-polygon object. Used that object in Ivy Generator to create ivy/branches, which cling to the shapes which compose the scene. Imported the branches back into Carrara, rearranged them and morphed them. Then added the leaves. Finished by tweaking the shaders, expressions and reshaping dynamic hair where needed. Early on I decided that for lighting I will use an HDRI image with no light through transparency, but WITH indirect lighting and caustics turned on. This meant that I needed to avoid transparencies as much as possible. I solved the eye-surface issue by using glow in the eyes and I made sure that none of my other objects relied on transparencies. The eyelashes seem to have been OK from the use of caustics and indirect lighting. There are no Carrara lighting in the scene whatsoever. and the 2800x2800 render at Excellent light quality and 1px precision took under and hour and a half. http://www.daz3d.com/forums/viewreply/584611/ - 3D sketching stage, playing with ideas. http://www.daz3d.com/forums/viewreply/589268/ - pre-postwork final render. Postwork: played around with render passes. Enhanced some, dimmed the others, or mixed their effects using layer masks. Painted some stray hairs, and some barely visible highlights on the man's teeth and gums. Added some noise and almost insignificant DOF effects using Lens Blur. 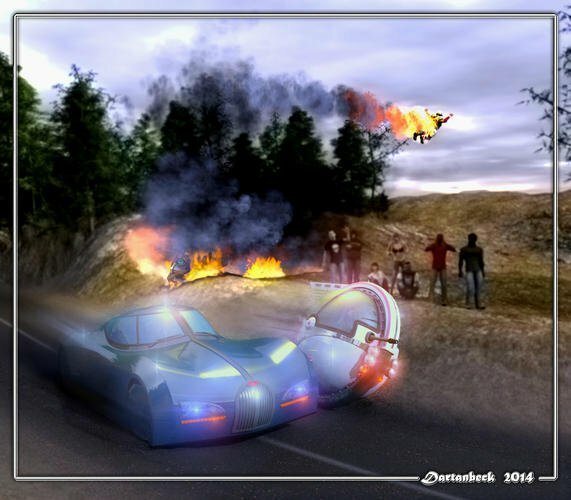 - Title: "The Great Race 2014"
- 1st Required item: Terrain made with several depth maps and filters. - 2nd Required Item: A second, custom Terrain made using only Carrara Terrain modeler filters and generators, several particle emitters with custom shaders, several fires. - Postwork: Color grading and a few layers of blur effects using Project Dogwaffle Howler, which was also used to create the height maps and some of the texture image maps. - Theme: The Great Race. - Description of required use of the terrain editor. "I took a texture map and bought it into the terrain editor as my height map. I used the same texture map as the replicator shader for my plants that are replicated on the terrain. That didn't work so I duplicated the terrain and erased polys that I didn't want plants on, then replicated the plants on that with the terrain shader. The terrains were stilltoo bumpy so I flattened them a little with the scaling tool. - Description of 2nd required custom use of Carrara: Modelled the sign, the bunting and poles. I replicated the bunting across a 'rope'. There is hair on the front two 'bots' but you can't see it. I kit bashed for the front three 'bots'. The human arms are from a low poly early poser human figure. Retextured turtle. - Credits Nogins Hare, Daz tortoise. K4 skateboard helmet. Billboards from "The Neighbour's Yard", Big Bot "Haystack"; Bots from Robo Buds, Trees LB oak, weeds from Pdetaron, Flowers from LisaB. 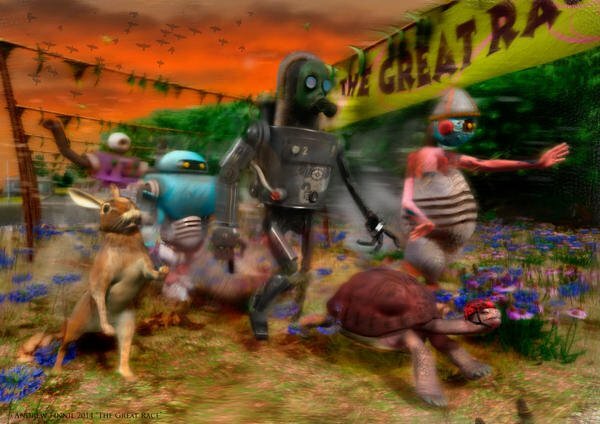 Links Robo Buds http://www.daz3d.com/robo-buds Haystack http://www.daz3d.com/haystack. Ron's brushes various. Fenric's plug ins various and highly recommend them. Fragment coverage pass is a godsend. Highly recommend it if you do post work. Had to take the limits off the RoboBuds to get them to p ose properly, also on the Hare to get him to stand up. Thanks so much diomede64 for a wonderful job and thank you to mmoire for his kindness in sponsoring the challenge! Title - Why won't it work? Description - a steampunk style race theme. 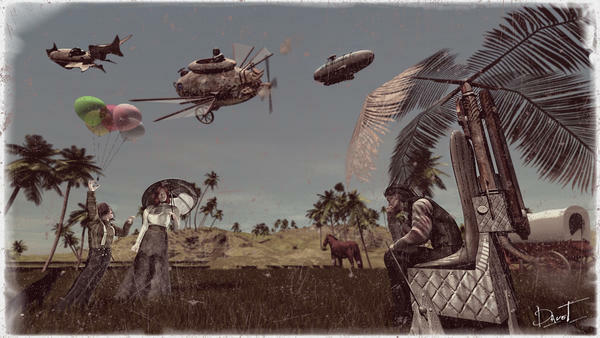 flyer & steampunk palm flyer. 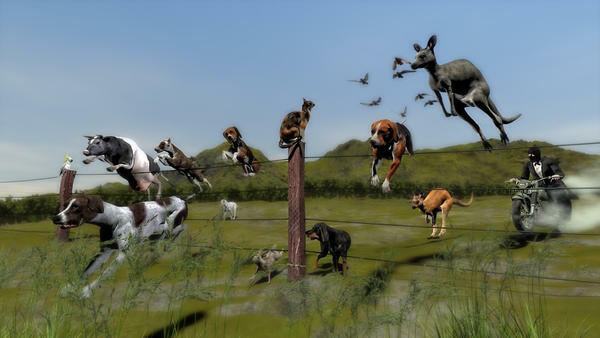 Description - The animals making a hasty escape. Description: The scene is supposed to be evocative of a small pioneer family plot common in the rural mid-west. The tree shades the aging and forgotten headstone, while at the same time proves that even seemingly inanimate objects can burst through fences if given enough time. Carrara Scene Requirements: I inserted a terrain and customized the settings to fit the scale of the scene. I painted a distribution map on the terrain to distribute spline grass I built and shaded. I made a terrain shader to complement the grass. I built the tree in the Vertex Modeler and defined shading domains which I used to replicate tree branches on the trunk. I built the fence pickets in the Spline modeler and created a weathered paint shader. I built the tombstone in the Vertex modeler and painted a custom distribution map to drive the moss and lichen shader I made. I used Photoshop to paint the lettering for a bump map and for the moss/lichen distribution map. Built the fern in the Vertex Modeler and painted the texture using the 3D paint tool. The clouds are my own preset. Postwork: I rendered a Depth Pass, did some modifications to it (see link to last WIP) and used that to create a subtle DOF in the final scene. No other postwork. - Title: The jogging of the lake. I would have liked to work it a little more, but… lack of time! There are superb entries this month with really original applications of the terrain editor but I preferred to remain in the traditional use of this option. - 1 principal ground modified to create a path. - this ground duplicated to insulate the way and to create a texture for it. - 3 other terrains for the background. - Trees duplicated and some of them converted. - Grasses of which part were “home made”. - A rabbit and a duck created by “Lynde”. - Several versions of M4, of which a fisherman (all his material built by myself: the seat, the telescopic fishing cane, the mill, the wire and the float, even if that is not seen in this scene %-P). Realized entirely in Carrara, render one pass, no postwork. - 1st required item: Terrain Editor: Used the map editor to adjust a default terrain to put in a digging hole, then exported it to photoshop. Used photoshop to create a road, parking lot, and river, along with appropriate shader masks. Brought the terrain back in Carrara and applied custom shaders to the road, parking lot, and stream bed. - 2nd required item: Used vertex modeler to create a dress for the Poser5Judy figure and work coveralls for M3. Applied custom uvmaps. - Credits: No plugins but lots of credited 3rd party content. Two M3 figures, one Poser 5 Don, one Poser 6 James, and one Poser 5 Judy. M3 morphing clothes (shorts, flipflops. 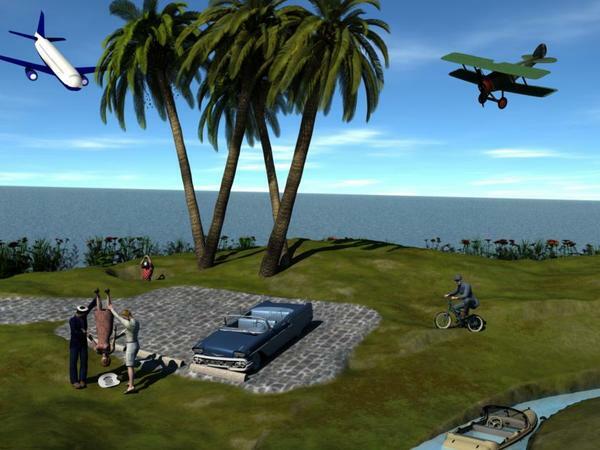 Daz biplane (retextured), Airplane from Carrara content browser, 36AM Sedan (retextured and alph applied to make a convertible), 58impala, wycoff hat, A3 captains hat, P5 Judy necklace 1 (retextured), BMX bicycle (retextured), palm trees and background foliage by Lisa Botanicals. used: terrain converted to vertex object flattened and tilt some ploygons and used some of them as a shading domain for the road. replicator for the "small pipe and light" at the sides of the road. The title is self explanatory. Most of the fences we face are self imposed. - 1st required item: Terrain Editor: I used a stack of mesas to obtain the look I wanted (see Wip). 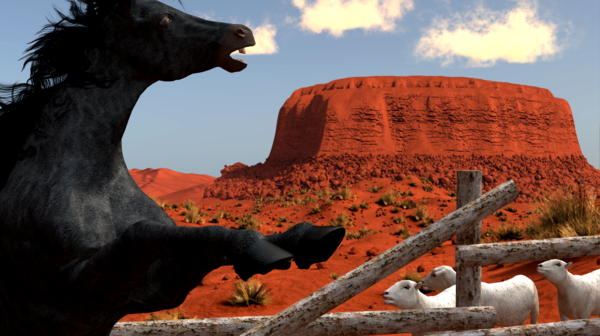 From Daz : Millenium Horse, Daz Sheep. - Postwork : Level edition and a bit of framing. - Theme = Don’t fence me in. Vote for up to three images and one provisional tie-breaker. If an artist has entered more than one submission, then all votes for images by the same artist will be combined for a single score. You can't give more than 1 vote to a single image, but you can vote for two images by the same artist. If you need to know all the details, I will copy the voting rules below. This is going to be a hard decision, let me tell you. Heart warming to see so many new 'faces' entering.! Thanks again to mmoire and Daz of course. Really great entries and again very hard to decide on a list of three - all entries are really very good, and many wonderful. #7 Antara - this is really an exceptional image! #8 Dartanbeck - very dramatic, and a nice bit of humour too. If required I will give the special mention to Stezza's other image (#10). #8 Dartanbeck - Truly amazing! Brilliant details in the scene. I also loved the use of Carrara particles there. Those fire/explosion/smoke clouds look fantastic! Both tragedy and a bit of fun in the story. Classic. #4 Varsel - I love those robo-horses. Great concept! The live dog makes the image come to life for me. Perfect detail which adds fun, reality, dynamic and the sense of sound to the image. Lovely image. It somehow feels like a snapshot from a better, less cruel and more fun world. Made me want to visit it one day :). Provisional Tie breaker - kashyyyk. I really liked kashyyyk's entry #3. Those leaves lifted off the road are a great detail. Provisional Tie breaker vote- 12 evilproducer for the real nice scene. Yeah, well what a hard choice, there's some tom terrific renders. Great imagination. Loved the racing helmet on the tortoise! It's been fun joining in, but now time to vote for the "real" artists and am grateful to be able to learn from all their entries about new techniques or applying normal ones in more creative ways. There's something brilliant about all of them, well done! Great contest, Diomede! Entry #16 Philemo Looks so realistic, just like Monument Valley, even down to the valley floor and vegetation. Great horse! timeline and re-importing) It's whimsical and makes me laugh, too! So many very nice images produced. Hard to choose between them. I always hesitate to vote on things like this because a) it is so hard to pick just a few and b) I tend to just "like" something without being able to articulate reasons. #6 - SileneUK I simply think this is a really cool image. I like the color palette and interesting take on the contest theme. #12 - evilproducer love the mood and feel of the image. Very nice take on the contest theme. Thank you to everyone who has already voted. It is a tribute to our participants that so many different images are receiving votes. Please remember that you may also provide a provisional tie-breaker vote for an artist if you have not already cast a vote for one of that artist's images. If you have already voted, you can still edit your post to add a provisional tie breaker if you have not already done so. Still much of impressive creations this month and thus, still difficult to make its choices ! This composition dazzled me since the beginning, moreover it's a very impressive work! I would adore to have this work like painting in my living room, I would contemplate it during hours in the search of each detail. … it was necessary to think about that for this topic!